There is no better place to see that relationship in action than on the airwaves of PBS. PBS is your home for high quality (and sometimes not so high quality) drama and documentary programming. PBS has developed strong relationships with British producers, especially with the BBC, a regular partner with PBS in co-productions. 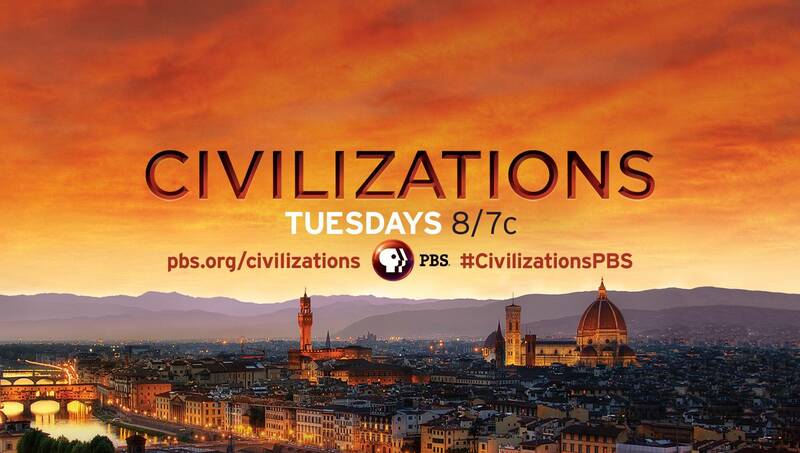 This week PBS began to air a landmark documentary, "Civilizations." It’s a show that has already started to air on the BBC. To the actual program itself, is different between the two broadcasters. What’s got our friends in England up in arms is the news that the most obvious difference is that the BBC version is built around individual presenters who each present whole shows. 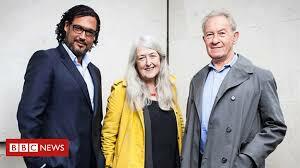 The presenters are Simon Schama (probably well known to PBS audiences); British historian David Olusoga, who has presented previous documentaries; and classicist Mary Beard, a prominent Cambridge historian and feminist. The PBS version has a narrator and other experts who appear (sometimes a lot) along with Mr. Schama, Mr. Olusoga and Ms. Beard. The criticism is that they, particularly Ms. Beard, have been excised. Yes I noticed I hardly appear (not to mention, more important, the disappearance of most of my actual argument!).. cant help think that a slightly creaky old lady with long grey hair isnt ideal for US TV?? For those of you unfamiliar with Mary Beard, she is a force of nature. She is a renowned classicist who has crossed over and garnered a universal following, particularly amongst women. She is unapologetic about her age, and how she looks and she has seen off her social media trolls with aplomb. She has legions of supporters and some have been making themselves vocal in our inbox. "How could you cut the appearance of Mary Beard on Civilization? No need to donate to one with such editing. She is more prominent and better versed than the men commentators. Perhaps you did not know about the respect for her and latest work about women." "Dear PBS What a deeply stupid decision to take Mary Beard off of her BBC Civilisations tv programmes. She is one of Britain’s top classicists and massively respected in Britain. For PBS producers to take her off the screen is a banal absurdity and only goes to prove how out of touch they are. Yours in disgust Malcolm Rasala"
My first response to this storm is, everyone calm down. I have seen a couple of episodes of both the BBC and PBS versions and, indeed, the presenters are not as prominent in the PBS version as they are on the BBC version, but they have not been removed completely. They appear more as a bit of a hybrid, part expert, part weaver of a narrative thread. In the British version they do all the voice-over narration, too, and write their episodes. In the U.S. version the shows are narrated by actor Liev Schreiber and the narrative arc is quite different. So how did these shows come about? There was a discussion between the two companies about a co-production on the global history of art, which became a reboot of the classic 1969 series, "Civilisation," produced by the BBC with Sir Kenneth Clark. There is a lot of material that is common to both versions, but unique material, too. Did they make one version and then decide what they needed for the other? No, says Gardner. 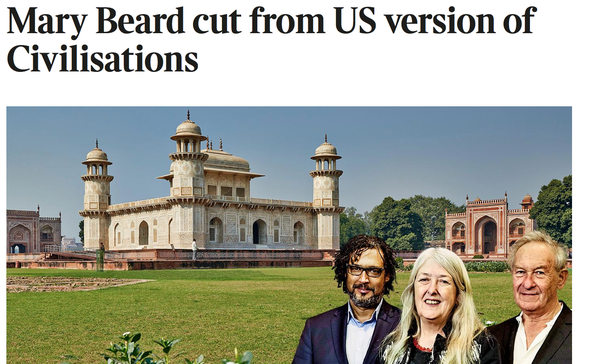 So for those of you worried that Mary Beard has been unceremoniously disappeared from the PBS version because of her age or her looks, that is not the case. She and her fellow presenters do appear in the U.S. version, just in a very different way and not as much as in the British version for the reasons outlined by Mr. Gardner. Of course, the question then arises, is one version better than the other? To that I would say, they are just different. When Schama or Beard has “ownership,” they are presenting an arc and a thesis that leads them to an assessment about their themes. It doesn’t work quite the same way with the U.S. version and that will leave some disappointed. They are definitely different narrative experiences. I’ve addressed the issue of changes in co-productions before. It is a fact of life that producers cater to different markets. "Great Yellowstone Thaw" became "The Great American Thaw" on the BBC, "Wild Alaska Live" had different hosts with specialized content. There are things that work for an American audience that won’t work for a British audience and vice versa, or sometimes it's just a question of emphasis. Posted on April 20, 2018 at 12:27 p.m.